ODIN'S VOLK is an ethnic, spiritual and cultural organization that is commited to remaining free of all political manifestations, therefore we refuse to ban any of our ancient spiritual symbols simply because some of them have been used by political groups, both past and present, as to do so would in itself be a political act. We will not ever use them in any offensive way, but neither will we be ashamed to use the sacred symbols of our people. Much to the dismay of our detractors, we who are revitalizing our folk ways after such a maligned period of historical miseducation, we have continued to struggle to "rehabilitate" and maintain the true, honest use of our ancestral symbology. Some symbols have only been misconstrued over the last sixty years when they were used with the most vigor. It is a disgrace that some modern day individuals and groups continue the misinformation campaign against our symbolism and equating it with maliscious purposes. It is a matter of time, until those folk will wake up to its much more encompassing passions and how it should affect internal change and external pride rather than external change and internal pride. 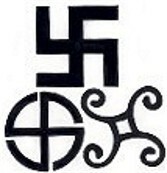 Our symbols have existed for many millenia free from any conatations of fear and racial hatred. Unfortunately, there presently exists multiple groups of people and government sponsored organizations who believe it is their job to save the world from racists. For these groups to survive they must continually find more racists to justify their own existence. In the past few years these groups have focused on our ancient ancestral religion; Asatru. Some of these groups have gone out of their way to bring dishonor to our people and our religion. To further their goals these organizations lie to law enforcement officials, they lie to the media, and they lie to many of the people that they represent. These lies have been proven to be false time and time again. The Anti-Defamation League’s decision to list the Thors Hammer, Valknot, and certain runic symbols as Neo-Nazi or generic racist symbols is an insult to our people. It offends everyone who is Asatru. Our sacred symbols represent that which is best in each and every one of us and what our people are, they are our strength, and our protection which empowers our us as a people to have the willingness to stand, no matter what the odds are because in the end we will overcome ALL detriments placed before us. Listing any of our sacred symbols in this manner is absolutely unacceptable, trying to list it, as heathen symbols co-opted by racists is an attempt by The Anti-Defamation League to discriminate against Heathens since Christian, Moslem, and Jewish holy symbols are all used by their own racists ( such as the Christian KKK, the Jewish Kach Movement, and the Muslim Nation of Islam, among many other groups) but are not included on their lists. Asatru is not a religion based upon fear or hate, and we have an in-defiable right to use ALL of our ancient sacred symbols without being associated with fear and racial prejudice. These are OUR symbols, and only we will dictate how they will be displayed and how they are going to be used. We will also live with those consequences and take that responsibility. We are a diverse people; we exist in all walks of life. We honour the laws in the lands where we exist and we honour a person right to believe in whatever religion they choose. We honour our the Germanic Gods and Goddesses as our ancient kin, (the gods of the various Germanic Tribes) and live our lives by the Nine Noble Virtues. We look to peacefully live our lives by our own morals and build our religion for our future generations. SACRED SYMBOLS OF ASATRU: The objects the Germanic peoples used in their religious ceremonies and in everyday life are usually very rich in spiritual symbolism, often incorperating motifs of celestial importance. Throughout the many millenia of their existance, our holy symbols have manifested and appeared in a great many variations, often appearing very stylized and at times somewhat cryprtic. TOTEM ANIMALS: The ancient Germanic tribes lived in harmony with nature, and as their spiritual beliefs are based very much on the natural world, both wild and domestic beasts are highly revered. It was sensed that certain animals have special unique energies and elements of their nature and being that brought them into association with that of the various Gods and Goddesses whom they came to represent. These totem animals are often seen in dreams and visions as symbolic bearers of wisdom and might. BEAR:The Bear is considered the greatest of all beasts, and are held sacred to Thor. Bears are considered to be similar in personality and temprement to humans as they are intelligent, curious, highly adaptable, brazen and persistant creatures, with an inate awareness of fairness and honour. A common favorite of berserkers and shape shifters, the Bear is often the totem spirit of those who are extraordinarily strong of body, mind, and soul. 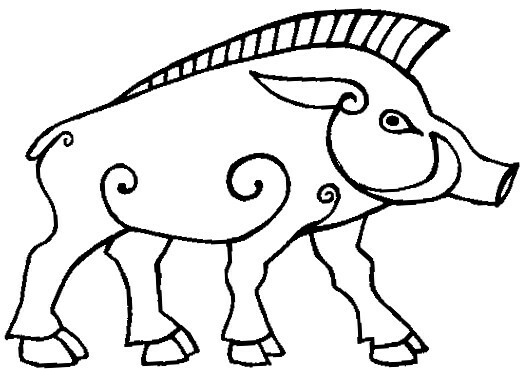 BOAR:Linked to both Freyr and Frejya, the boar is traditionally associated with protection from harm. As an warriors' symbol, its body often formed the crest on helmets representing a potent sign of protection and ferocity in battle. The Wild Boar is the mightiest of the totem amimals of the Vanir. The Boar first taught mankind the arts of agriculture by showing us how to plough the Earth before "sowing" seeds by rooting up the ground with his tusks. 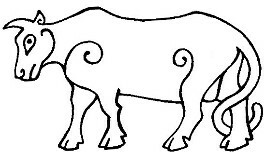 BOVINE:Agression and strength werehighly valued vitues to to Warrior Germanic tribes, Qualities assosiated with their most potent animal totem symbols. 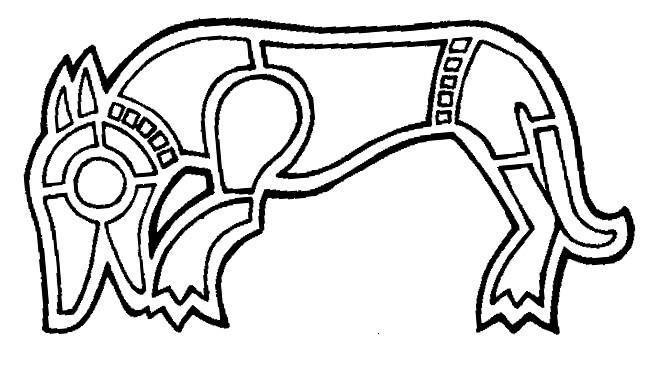 The untamed bull was venterated in all parts of Europe settled by the Germanic peoples, although its warlike connotations were tempered by its symbolic link to fertility and agricultural plenty that was assosiated with its counterpart the Ox. DRAGON:The mighty Dragon is the dweller of the burial mound, and the physical and psychic embodiment the Earths natural powers of fertility. Representative of natural electromagnetic Earth energy, pictured as slithering across the skin of the earth, As the great serpent guardian of gold, the Dragon has been closely assosiated with unseen power, fertility, protection and esoteric wisdom. EAGLE:The Eagle is considered the greatest of all birds, and is held sacred to Odin. Ancient tradition denotes that the Eagle's scream portends the birth of a heroic soul, while the mightiest of eagles sits atop the World Tree - Yggdrasil and represents the uppermost aspects of the conscious mind and is the ultimate in spiritual attainment, embodied in the Noble soul. HORSE:The Sacred Horse is a potent symbol of intelligence, speed, grace, strength, virality, and fertillity. Its flowing mane representing the brilliant rays of the sun as the Horse is the beast which carries the wagons of the Sun and the Moon across the sky. 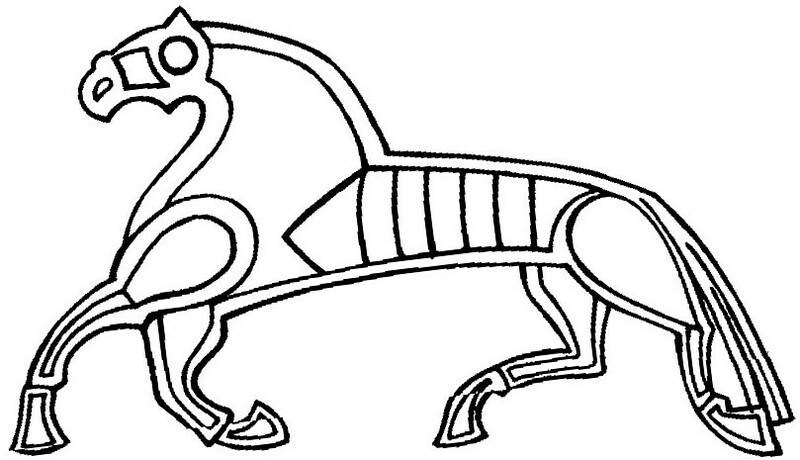 Images of Horses appear on many early Bronze Age rock carvings depicting ancient scences of fertillity rights. The Stallion is held especially sacred to Freyr and Wotan, who would sometimes take residence in the body of a one of the Horses kept at their temples. These Horses contained cosmic wisdom and were consulted by priests who would decypher their neighs and snorts in divinity rites. RABBIT:The motif of the rabbit is held sacred to Idunna in her contenental aspect of Eostara / Ostara, Goddess of the spring and renewer of life. 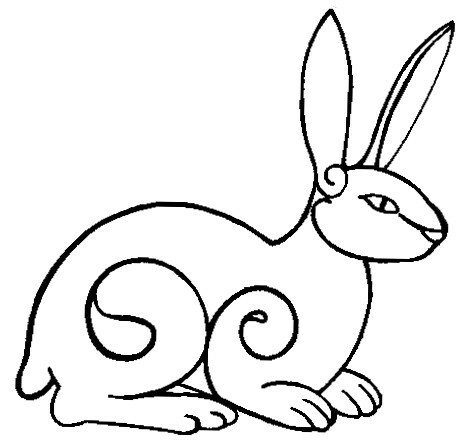 As her totem animal the rabbit became a potent fertillity symbol in ancient times due to the rabbits well known ability to multiply rapidly. RAVEN:The Raven is most closely associated with Odin, and as such, are birds of cunning, swift moving intelligence, esoteric wisdom, victory, war and death. Odin's two ravens, named Huginn and Muninn (translated as "thought" and "memory" respectively) sit at each of his shoulders and whisper in his ears all they see and hear. Shamanically, they represent the mind of the seer, flying silently through the 9 worlds of the universe, gathering hidden knowledge, gaining in wisdom, insight and inspiration. As birds of omens, the flight of ravens were used in predicting the future, while their harsh cries foretold the outcome of battles. Carrion birds associated with death, ravens will accompany the souls of the dead to the various afterworlds, and as such are blessed with the clear vision of the mysteries of life, death and rebirth. Under the raven banners, the Viking invaders were said to be invincible against the English armies. 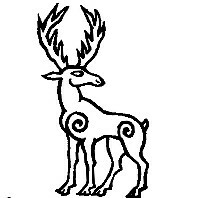 STAG:the Stag is a beast of noblility and Freyrs symbolic totem animal. The symbol of the Stag went beyond its obvious Maleness and agressive qualities; the splayed antlers associated with the king of the forest because of the similaritiy to branch growth. And, like the decidious species of trees, the annual shedding of antlers in spring and autum made the Stag the embodiment of the cylical growth-decay-growth of nature. Along with the Wild Boar, the Stag was the most prized quarry of hunters. APPLE:Idunna is the Goddess of eternal spring, immortal youth and vitality, and the gaurdian of the Golden Apples of Imortality, she alone is allowed to pick these sacred apples which represent fertillity, youthful vigour and vibrant life force. 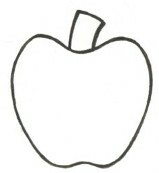 Idunna shares her magical apples with the Gods and Goddesses everyday to bestow immortal youth and beauty upon all ate them. Idunna carefully gaurds her golden apples in her magic basket as they are considered the most prized treasures of Asgard, and no matter how many she withdraws from her basket, the same number always remains for distribution at the feasts of the Gods. 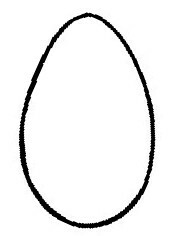 EGGS:a potent symbol of the forces of fertillity, life and rebirth. FOOTPRINT:Found on very early bronze age rock carvings, the symbol of the bare footprint in is associated most often with the cult of the Vanir, and it is a mighty symbolof the pressence of the Gods, bringing fruitfullness to the land and people. FYLFOT: The Fylfot (meaning "four footed") is Mankinds oldest and mightiest power symbol, appears nearly world wide in some form. 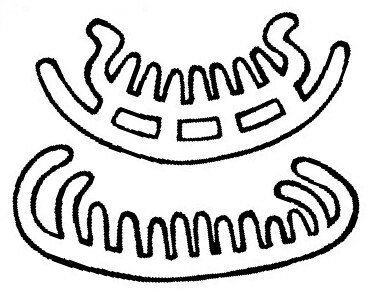 There are thousands of variants of this mighty symbol in the Germanic Heathen tradition and is commonly swirling in both clockwise and counterclockwise forms without any change in meaning. Associated with fire and lightning, the Fylfot is particularly holy to Thor, and is a potent symbol of dynamic cosmic power, and unstoppable swirling strength of the will, invoking his might & protection. 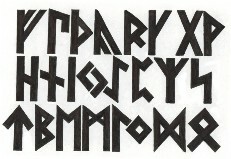 This motif occurs frequently throughout the lands of the wide ranging Teutons since the early Bronze Age and are prominent on cremation urns and carved memorial grave stones with early Runic inscriptions, seeking Thor's protection in the afterlife. 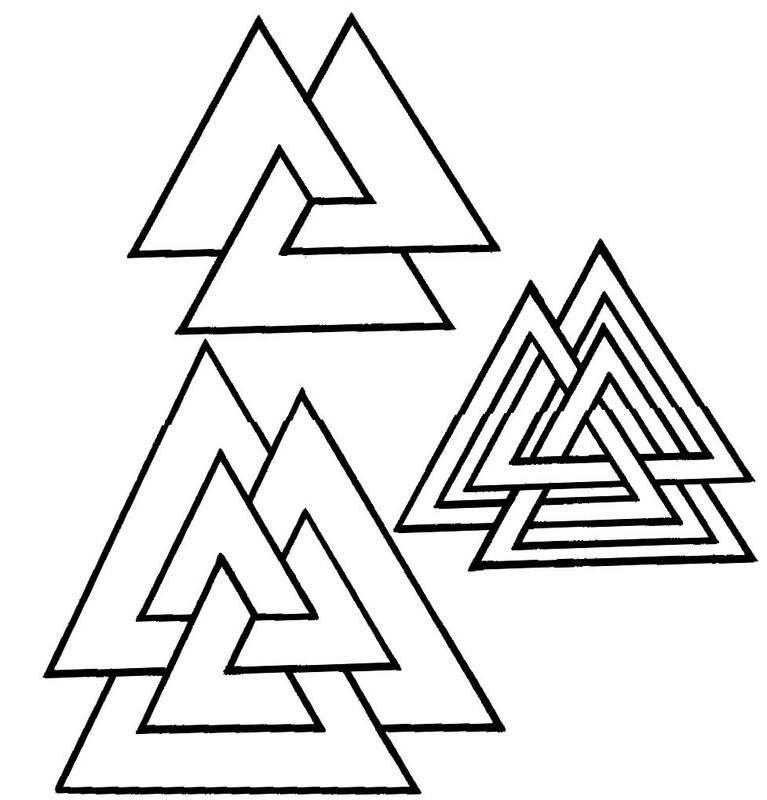 ODROERIR - Horn triskelion: A variation of the valknut, many believe this to represent the three cauldrons in which the sacred mead Odroerir is kept. 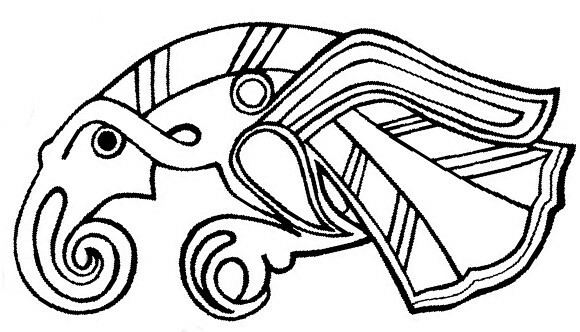 An ancient Teutonic symbol with shamanic roots, which shows the 3 cauldrons in which is brewed the mead of poetry called Odroerir (meaning "frenzy stirrer") made from the fermented blood of the wisest of the ancient Gods, KVASIR. Holy to both the Asir and the Vanir, whomever drank of this magical mead received the gift of divine inspiration, great wisdom, esoteric knowledge and poetic eloquence of speech. RING:The unbroken hoop is an ancient and potent symbol of the eternal nature of the Earth Goddess and the fertility and fruitfullness she embodies. In ancient art she is often depicted as wearing a neckring. As such the ring has been known to be used to swear sacred oaths upon in Germanic heathen religious rites. This tradition is still widely continued today with the tradition of the Wedding ring, and the sacred Oath Ring. RUNES: Runes are the symbolic expressions of the cosmic mysteries of the universe, discovered by Odin during his shamanic initiation. Rune magic developed and evolved, naturally, and uniquely among the various Teutonic tribes since the late Bronze Age. Runes were widely used in divination and have been inscribed on amulets, such talismans were primarily concerned with healing, protection, victory, fertility and growth. SHIP:The ship is commonly seen in rock carvings as far back as 5000 BCE. It is later seen on funeral stones, in graves, and is held to be one of the vehicles to reach the afterlife. 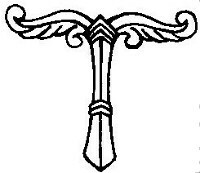 The ship is also a symbol of fertility and is associated with the Vanic deities, particularly Njord, god of commerce, and Nerthus who's image was carried around in a ship. To the Teutonic peoples, the ship was not just a means of transport, but played an overwhelming part of their spiritual and cultural developement. Its' use in fertillity and funeral rites Bringing the fruitful blessings of life to the realm of mankind and return to their heavenly halls bearing with them the souls of the Noble Dead. The symbolic use of the Ship as the means of otherworldly travel is defined by its association with life, death, rebirth, and fertility. 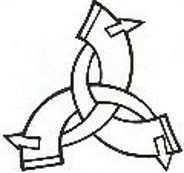 SHEILDKNOT: The Sheildknot and its variants are a powerfull symbol of protection. 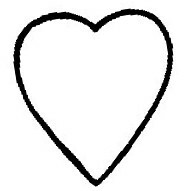 This symbol is still in use today in Scandinavian countries to mark off protected sites of archeological importance and ancient cultural heritage. SUNWHEEL:This cross within a circle is one of the many symbols of the sun, and one of the oldest spiritual symbols of the Germanic peoples.It is representative of the seasonal cycles of the year, the cycles of agricultural success in the field, and the cycles of human events within the year. It invoks the vital cosmic powers of life, fertility, peace and plenty from the fire of the heavens. The Earth is represented to this day by the sunwheel in scientific communities. It is the symbol of Terra Firma, our planet - the very center of all magical and other worldly culminations from all nine worlds. In ancient times small sunwheels made of wheat were set on fire and rolled down the fjords into the bay in Scandinavian rituals at Midsummer. 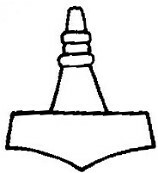 THORS' HAMMER:The Hammer is primarily a symbol and an instrument of hallowing or "making sacred." Thor is one of the most loved and honoured of the ancient Germanic Gods, due to his controll over the seasons. The hammer of Thor mighty hammer, Mjolnir ("the crusher") is one of the God's most precious treasures, and represents the life bringing fertility powers of the great cosmic phallus, and is the weapon with which Thor defends the Gods, Goddesses, mankind and their allies from the bringers of chaos and destruction, the Giants. The hammer of Thor has come to represent the whole of the Asatru religion. 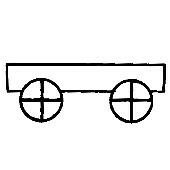 WAGON:The wagon is often found linked to the god Freyr, His image was carried around in a wagon in Sweden until late in the Heathen Era. The wagon like the ship, is associated with the mysteries of fertility, life, death, and rebirth. and is seen as a vehicle to the other worlds. VALKNOT:Appearing in ancient sacred images associated with Odin. 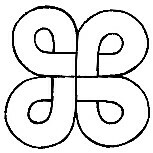 The "knot of the slain" is the symbolic sign of the coming together of the powers from the 9 worlds of the universe. 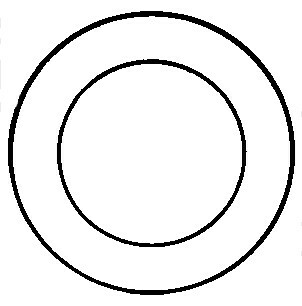 This is the symbol of Odin, showing his power to bind or loosen the minds and souls of man, subtly affecting the knotted web of fate as he lays bonds upon them, so that they become helpless in battle, or he could loosen the grip of fear by his gifts of intoxicating battle-madness and divine inspiration. YGGDRASIL / IRMINSUL: Yggdrasil is the "World tree", a gigantic tree and central pillar that binds connects binds the 9 worlds of the Universe together. Also know as The name Yggdrasil translates as: Ygg "terrible" + drasil "steed". Yggr is another name of Odin, giving a meaning of "Odin's steed"
Yggdrasil was known as the Irminsul to the contenental Germanic tribes, and historically, was an oak or wooden pillar venerated by the Saxons which was said to connect heaven and earth. The name Irminsul is translated as "mighty Pillar"and is derived from "IRMIN" the ancient contenental Saxon name for Odin (Old Norse: Jörmunr). Thus it represents a cosmic balance, order, personal power, spiritual creativity, growth, and hidden knowlage.